Three Hills Jr. A Girls Volleyball team took first place finish at their home tournament. The girls placed first in their pool and then won their semi final and final in two sets over Hugh Sutherland and Drumheller, respectively. Pictured l-r (front row): Lauren Boles, Annika Ferguson, Malia Van Doren, Kadence Smithson. Back row: Shauna Vaughan (Coach), Ashley Ferguson, Kylie Robertson, Taylor Vaughan, Braelynn Rosgen, Stacey Hainstock (Coach). 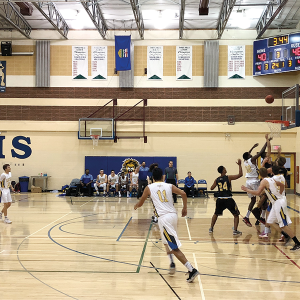 The ACAC Olds Broncos and St. Mary’s Lightning were at Three Hills School on Monday evening playing some pre-season basketball. The stands were full for this exciting game, with a concession stand set up fundraising for the THS girls volleyball team’s Florida tournament. 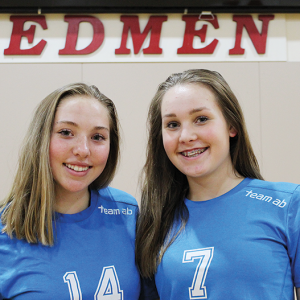 Two Acme High School athletes were among the select few chosen to make Team Alberta Volleyball this summer. Edan & Avery, both entering their grade 11 year at Acme High School were selected through an invitation process that began back in January 2018. Three Hills Cruise Weekend Committee member Dan Kanderka (right) presents a $4000 cheque to Aaron Tullikopf, Three Hills Golf Club Manager. The donation is the result of proceeds from Cruise Weekend 2018 events.